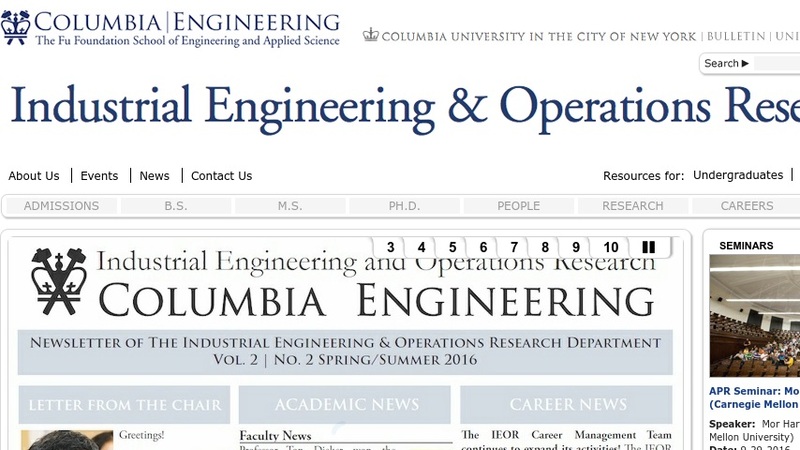 This is the website for Columbia University's Department of Industrial Engineering and Operations Research, which is "concerned with the design, analysis, and control of production and service operations and systems." The website describes two of the Department's research centers. The first, the Center for Applied Probability, supports interdisciplinary research on probability and its applications. The second, the Computational Optimization Research Center, specializes in "the design and implementation of state-of-the-art algorithms for the solution of large-scale optimization problems arising from a wide variety of industrial and commercial applications." Separate websites provide a description of research conducted at the Centers along with links to various publications.